After holding numerous committee meetings and public hearings, the full Constitution Revision Commission met this week to consider proposed amendments to the Florida Constitution. The CRC convenes every 20 years and has the authority to put issues directly on the ballot. The 37-member commission faces a May 10 deadline for finishing its work. Proposals that receive final approval from the full commission will appear on the general election ballot in November 2018. 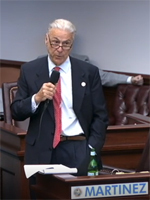 The CRC debated Proposal 4 by Commissioner Roberto Martinez, which removes Blaine amendment language from Florida&apos;s Constitution. First adopted in 1885, anti-Catholic and racial prejudice gave rise to the amendment in Florida, which prohibits public funding of religious institutions. The proposal received positive debate and support from several commissioners. However, it was temporarily postponed and will likely not be considered again by the CRC this term. Courts will ultimately rule on the application of Blaine amendments following a recent landmark ruling by the U.S. Supreme Court. The Court found in Trinity Lutheran that excluding a church from a government aid program violates the free exercise of religion as guaranteed in the First Amendment. If strictly applied, the Blaine amendment is problematic for the scores of faith-based organizations in this state that benefit virtually every segment of our society. Hospitals and clinics that provide needed health care services, housing assistance for the disabled and homeless, soup kitchens and food programs for the poor, prison outreach, disaster relief services, and educational scholarships are just a sample of the programs that could face an uncertain future simply because they are offered by faith-based providers. We thank the Florida Catholic Advocacy Network (FLCAN) members who responded to our January 2018 call to action and urged commissioners on the Education Committee to support this proposal. Proposal 22 restores the original intent of Florida&apos;s privacy clause as pertaining to informational privacy. The FCCB supports this measure as court decisions have extended the privacy clause to abortion cases, providing a broader right to abortion in Florida than allowed by the U.S. Constitution. While the proposal was defeated in committee last month, the sponsor, Commissioner John Stemberger, had the opportunity this week to present to the full Commission the need for and intent of this proposal. Although Proposal 22 was ultimately withdrawn from further consideration, this issue will continue to be litigated in our state courts through the appeal of a law requiring a 24-hour reflection period prior to abortion. The full CRC voted (19-13) to send Proposal 29 to the Style and Drafting Committee. This FCCB-opposed proposal, sponsored by Commissioner Rich Newsome, will return to the full CRC for a final vote. 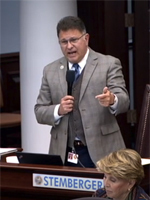 The proposal would require the Florida legislature to establish an employment verification process "to ensure that all employees in the state are legally authorized to work under applicable federal immigration law." improvement of employment verification systems as E-verify inaccuracies have caused otherwise-eligible workers, including citizens, to be disqualified from work. The CRC passed (19-14) an amended version of Proposal 54 related to the deregulation of the certificate of need (CON) process for hospitals. The Style and Drafting Committee will now draft the proposed ballot initiative language, which will be considered by the full CRC during the week of April 19. As amended, if any hospital in a county has an infection rate above the statewide average, the State of Florida could not prohibit any other hospital from entering the county to improve access to quality health care. FCCB is concerned that the proposal, sponsored by Commissioner Frank Kruppenbacher, could limit access to, impact quality of, and increase costs of health care. CON laws ensure that hospital services are available to every community, including low-income areas with high numbers of uninsured people. They require that hospitals provide certain volumes of covered services, which ensures quality and safety in the delivery of those services.